Star Wars 9 Has Matt Smith as a Young Version of a Classic Villain? 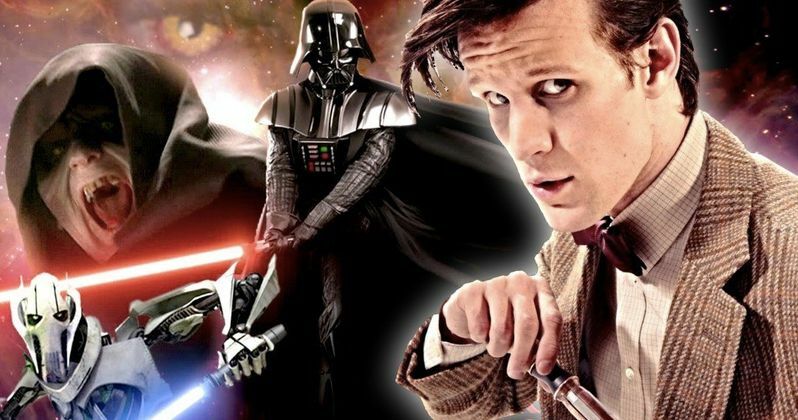 We may have finally learned who Matt Smith is playing in Star Wars 9. Right up front, we need to get two things out of the way. Firstly, this hasn't been substantiated by anyone at Lucasfilm or by anyone connected to the production, so it's important that this be regarded as nothing more than a rumor for the time being. Second, this could serve as a pretty big spoiler, so anyone who wants to head into the movie fresh as can be next year, turn away. Warning: possible spoilers ahead for Star Wars 9. According to the latest episode of The Weekly Planet podcast, the former Doctor Who star will be portraying a young version of Emperor Palpatine. This, should it turn out to be true, would be, in equal measure, possibly confusing and tremendously important. How can such a thing happen and what would it mean for the story? There are many questions something such as this raises. Again, assuming that there is any validity to this info, which comes from a completely anonymous source. First, assuming anyone were ever going to play a young Palpatine in a Star Wars movie, Matt Smith seems like a solid choice. Ian McDiarmid will always be Palpatine in the eyes of fans, so it may be tough for anyone to view Smith as the legendary Sith lord. But it's really all about execution, and that's on director J.J. Abrams. As for how this could happen? The first and most obvious solution would be flashbacks. It's not something the franchise has used all that much in the past, but The Last Jedi did make use of them a bit. The other, and perhaps far more intriguing option, is via time travel. Which, thanks to the final season of the animated series Star Wars Rebels, is canon. The episode A World Between Worlds even brought back Ian McDiarmid as Palpatine briefly and firmly established time travel to be possible in a galaxy far, far away. J.J. Abrams, should he so choose, could make use of that. Though, for casual fans, that may be a pretty tough pill to swallow. For the time being, the plot of the movie remains almost entirely a mystery. Lucasfilm is keeping things under tight lock and key, which isn't out of the ordinary. It was also recently revealed that this is being eyed as something of a course correction, given the very divided response to The Last Jedi. Throwing in crazy time travel elements would seem to be diverting from any sort of relatively safe course correction. It's also worth mentioning another rumor that suggested Palpatine could return in a scene featuring Kylo Ren. Whether or not these rumors turn out to be true remains to be seen, but it's starting to look like we maybe haven't seen the last of this Sith icon on the big screen. Star Wars Episode IX is set to arrive in theaters on December 20, 2019. You can check out the full podcast from the Weekly Planet YouTube channel below.